August 31, 2016, Baku - Azerbaijan Airlines (AZAL) announced the launch of a new autumn campaign, timed to Gurban holiday. 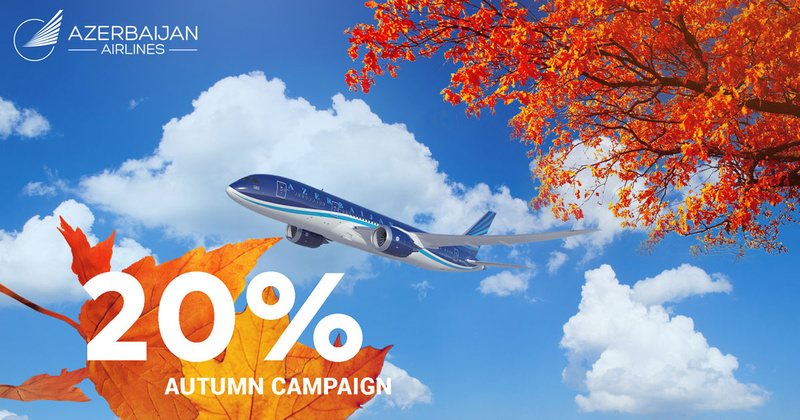 A 20% discount will be applied when buying round-trip air tickets in the period from September 5 to 30, 2016 to/from Baku to the following destinations: London, Milan, Berlin, Paris, Prague and New York. Departure period: September 15 - December 10, 2016. In addition, a 20% discount will be applied to tickets on Baku-Tel-Aviv-Baku route with the departure period from September 15 to 25 and from October 25 to December 10. Air tickets can be booked on the website of the company www.azal.az and purchased at AZAL sales offices and official agencies. Points for the flight may be credited automatically in case AZAL Miles member unique number will be entered in the appropriate filed while purchasing online.